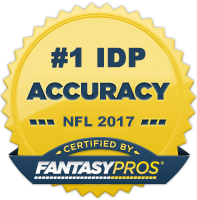 In an effort to bring you the best IDP information available, IDPGuru.com Staff Writer Johnny B. Davis will spend the coming months taking an in-depth look at statistics from past seasons to help IDP owners as we look forward to the 2012 NFL season. We’ll begin the series with the New York Giants defensive ends. Note: Snap count information comes from Pro Football Focus. Other statistics come from NFL.com. Defensive end (DE) Justin Tuck has been nicked up the last few years, but he often played through the pain and still found a way to put up big-time fantasy numbers and peddle $5 footlongs. In 2011, the injuries struck a little harder, causing Tuck to miss most of the first half of the season. He returned after the week 8 bye, struggled at first despite playing a significant amount of snaps, and then in week 12 started finding his stride. During this nine-game stretch, Tuck averaged 3.8 combined tackles (solo tackles + assisted tackles) per game. He averaged 3.1 solo tackles per game. If we extrapolate those numbers over 16 games, then Tuck would finish at 61 combined tackles with 50 solos. The 61 combined tackles would place fourth among 2011 DEs, behind only Jason Pierre-Paul (JPP), Calais Campbell, and Jared Allen. Defensive tackles (DTs) Ahtyba Rubin, Domata Peko, Haloti Ngata, and Glenn Dorsey also had more than 61 combined tackles in 2011, but their numbers were boosted by a high number of assists. The 50 solo tackles would place 3rd among 2011 defensive linemen (DLs), bested only by JPP, Rubin, and Campbell. These numbers would be in line with Tuck’s recent season totals and are even more impressive when you think about how injured Tuck has been. From 2007 to 2010, Tuck averaged 67 combined tackles with 48 solos per season. Tuck’s sack numbers are a little different. In 12 regular season games played in 2011, Tuck registered 5 sacks. He nearly matched his regular season total during a two-game playoff stretch including the conference title game and the Super Bowl when he totaled 3.5 sacks. If we look at the late-2011 nine-game stretch when we feel Tuck was in top form, we see that he totaled 6.5 sacks, or .7 per game. Playing at that pace for 16 games, Tuck would have 11.5 sacks. This would have placed him fifth among 2011 DLs, behind only Jared Allen, Jason Babin, JPP, and Chris Long. These numbers would also match up with Tuck’s career numbers. From 2007 to 2010, he averaged 10 sacks per season. Now, 2011 was a little different because Tuck had JPP - a tackling and sacking machine - playing significant snaps on the other side, but now that we’ve analyzed Tuck’s late-2011 performance, we see that JPP’s presence does not necessarily keep Tuck from being a fantasy asset. Tuck’s health, on the other hand, could hold him back, but if you feel like gambling that Tuck can swat away the injury bug, then he is capable of posting elite numbers for your fantasy team. JPP is a beast. I don’t have to cite any stats for you to figure that out. He had a phenomenal breakout 2011 season in which he positioned himself as easily the most valuable DL in fantasy and perhaps the most valuable IDP available. One thing we can analyze is this: Would the presence of a healthy Justin Tuck for an entire season hurt JPP’s stats? On the other side of the coin, would JPP benefit from more lost time for Tuck in 2012? During the 2011 season including the playoffs, JPP averaged 60 snaps per game. During the nine-game stretch when we feel Tuck was in top form (throwing out a ridiculous 93-snap outlier), JPP averaged 63 snaps per game. During the other 11 games when Tuck either didn’t play or was clearly held back by injury, JPP averaged 56 snaps per game. That’s not a huge difference and it could be affected by many factors other than Tuck’s status, but it’s certainly interesting to note that JPP played more snaps when Tuck was in top form. What about on-field production? During the top-form-Tuck stretch, JPP averaged 5.9 combined tackles, 4.7 solos, and .5 sack per game. During the non-Tuck stretch, JPP averaged 4.6 combined tackles, 3.4 solos, and 1.1 sacks per game. So if these numbers don’t lie, JPP is a better tackler when Tuck is in top form. However, the numbers also lead us to believe that Tuck in top form hurts JPP’s sack numbers. Depending on how your league’s scoring system rewards tackles and sacks, this could be useful information. If you’re in a tackle-heavy league, JPP is more valuable if Tuck is in top form, but his value slides a bit if Tuck gets injured. If you’re in a big-play league, JPP is more valuable without Tuck, but his value decreases if Tuck is hitting on all cylinders. The bottom line is that JPP can be an impact player on your fantasy team no matter what Tuck’s status is, but keep in mind that Tuck’s health or lack thereof could affect JPP’s numbers. Umenyiora has shown the potential to be a fantasy stud when healthy and when given a significant number of snaps. For years he has carried around contract issues like a ball-and-chain, and there’s a chance he may not be a Giant much longer. Once his future is a little clearer, we will take a deeper look at the man with way too many vowels in his name. If you have any questions for Johnny B. Davis, feel free to contact him at JohnnyDavis@idpguru.com or on Twitter @JohnnyBDavis. Also, feel free to post any questions or comments below.